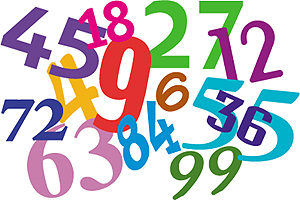 Some people think some numbers are especially lucky or unlucky, some other people think all numbers are just numbers and they are neither lucky or unlucky. What do the members of your group think about this? Do some numbers seem more lucky or unlucky to them? The number 13 is thought by some people to be unlucky. Hammurabi set up one of the first set of laws to govern a Western country in Babylon about 3,700 year ago; it contained about 280 laws, but no law numbered 13. In Thailand, the Thai numbers for "13", when rotated, are said to resemble the Thai word for "ghost". Some tall buildings do not have a lift button numbered 13 (they go either 11,12,14,15 or sometimes 11, 12A, 12B, 14, 15...). There is no car numbered 13 in Formula 1 car racing. Some airlines have aeroplane seating plans that do not have a row numbered 13. Some big aerodromes do not have a departure gate numbered 13. Friday 13th is considered by some travellers a particularly unlucky day to fly - although other travellers say it is a good day to fly because there will be so few passengers that you will have plenty of space in the aeroplane to stretch out! Some big numbers are thought to be unlucky too; when the wife of the late American ex-president Reagan found her new ranch address was 666 St. Cloud Road, she refused to move in until the number was officially changed to 668, because she thought 666 was unlucky ("the number of the beast"). However, if she had been Chinese, she would have been pleased because in China the number 666 is considered lucky! In China the number "8" is also considered lucky. The Mandarin word for "eight" sounds similar to the word for "prosper" and, in Cantonese, it is close to the word meaning "fortune". The Chinese characters representing "double joy" resemble the digits 88. Did you notice that the last Olympic games in China started at 8 seconds and 8 minutes past 8 o'clock on the 8th day of the 8th month of 2008 (often written 08:08:08 08/08/08)? Was this lucky for China? - Guess which country gained the most gold Medals! Two page mentor notes for this Challenge (Microsoft Word 2003 format) can be obtained by clicking here.